Est 1924, we are the longest serving MHSAA local approved association in the state of Michigan. Starting with the 2018-2019 school year, we will be entering our 95th season promoting sportsmanship and ethics for our student-athletes. Our motto is Mutual Understanding Creates Better Sportsmanship. 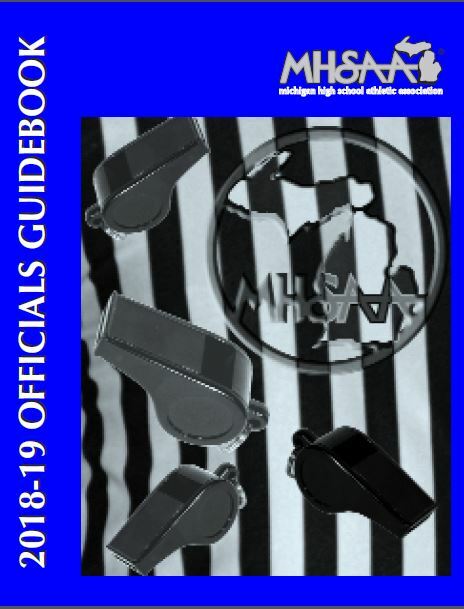 The MHSAA 2018-2019 Officials Guidebook is availabe here and on MHSAA.COM. Registration as an MHSAA official is a privilege and as with all privileges, there are responsibilities, outlined in the MHSAA 2018-19 Officials Guidebook. There are two purposes the guide serves, second of which provides both new and veteran officials with reminders of policies and procedures that must be followed if they are to remain in good standing with MHSAA and its more than 1,800 member junior high / middle schools and senior high schools. You may pay your $20 membership dues using a Paypal account, credit card, or send a check to the GCCOA Treasurer (refer to About GCCOA tab of this home page for the address. To pay using your PayPal account or with credit card, click the PAY NOW button. Be sure you note your name in the comment field in case it is not obvious by your email address. To recieve emails regarding announcements and information to be shared, click to subscribe and confirm your subscription. You may opt out at any time.